This year I am supervising the theses of Neal Robben (together with Geert Vanderhulst) and Tijl Lathouwers (together with Carl Bruninx). Both theses are related to UIML and Uiml.net. 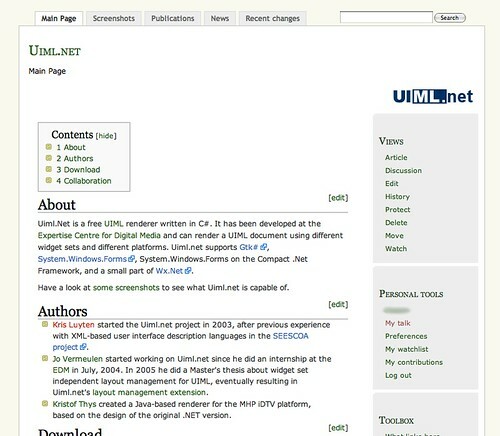 Neal will be extending Uiml.net to support distributed user interfaces, while Tijl will be looking into adding metadata to user interfaces and using this metadata for adaptation purposes (e.g. personalization or device adaptation). More information can be found on Neal’s blog and Tijl’s blog. I am currently moving Uiml.net towards MSBuild files (a.k.a. Visual Studio project files) and experienced a few problems such as a restriction with Compact .NET’s OpenFileDialog. After a bit of Googling, I finally know why I can’t seem to get the OpenFileDialog to look for files in \Program Files: it was just designed that way (do a quick search for OpenFileDialog on that page). Apparantly they wanted to help users organize their files, by restricting them to the \My Documents folder. Too bad they didn’t think of what developers might want to do … I want to allow people to try UIML examples when they click the “Select UIML file” button. Of course these files reside in the Uiml.net application directory itself, so I need to allow them to pick a file outside of the My Documents folder. If that wasn’t bad enough, it further restricts you to one level of subfolders within the My Documents folder! I also noticed MSBuild has no nice way of copying a file to another path than the one it is being referenced from. I orginally wanted to copy the front-end files and vocabularies in the root directory where the Uiml.net executable is placed. Since I didn’t find a solution, I made dedicated directories for these files, and modified the code to look for them in those directories instead. If I could tell MSBuild to copy a file to another path, I could also solve the OpenFileDialog problem just by copying the Uiml.net examples to the My Documents folder, while the rest of the application would stay in the Program Files folder. So my (hackish) solution is now to copy all examples first into a direct subfolder of the user’s My Documents folder. Not very elegant, but it works. I just registered Uiml.net and Cassowary.net in Launchpad. Launchpad automatically creates a Bazaar branch from the CVS repository, which allows me to maintain my work in Bazaar, while still importing changes from the Uiml.net CVS tree. It’s been a while since I reported on Uiml.net. We set up a wiki recently, which will eventually replace the old project page. There is still some content to be added though. Volker Janzen, a computer science student at the university of Ulm worked on a Windows CE application that retrieves meta-information about medical studies from a CDISC-ODM file, and transforms this data into UIML. This work was done for his diploma thesis. A question we receive frequently is if we can send people the Visual Studio workspace. It would be good to upload that to the Wiki, and maybe do a formal release in the near future.